My brain can be stubborn and resistant. I can be told a thousand times that something would be good for me, or help a situation, and and I refuse to take it seriously until I can go home and experiment for myself. I need to be able to see concrete evidence that something is working before I'm willing to include it in my routine. Habit tracking has become a really important part of my wellness practices, because the data I collect helps inform my decision making. And when things get a little off the rails, because of a deadline, or an illness, or a heat wave, or just life, I can quickly reference my data and counteract the voice that says that the habits don't make a difference in my day-to-day experience. So here are three ways to collect data on your habits, so you can see what things you're doing, how often you're doing them, and if they're having an impact! One of our #MindfulPhD chatters, Daria Pizzuto, shared her habit tracker here. By keeping it simple, this becomes a very practical way to see all of your habits, and the relationships between them easily. I love that this restarts every week, because fresh start energy can't be underestimated! This simple tracker could easily be done on a post it note, or even in a spreadsheet digitally. The simplicity makes it much more likely that you'll both create it and use it. I also track my habits in my bullet journal, but in a slightly different way. Because my pain condition, endometriosis, is tied to my hormonal cycles, I find it really useful to track habits on a month to month basis. I also am extremely motivated by colors and enjoy the process of making these trackers each month. Seeing all my habits side by side really helps me to see the patterns. This mega tracker combines my habits and a cleaning chart, but ended up being too small to be practical. Other than being maddening to create, I liked this spiral box tracker a lot. Sometimes, our goals and habits are completely intertwined, and it is hard to track one without keeping track of the other. Enter my new favorite, Strides. it's available as an iPhone app, as well as a standalone web application, and it is free for up to ten habits (with the ubiquitous premium plan if you want to track more.) 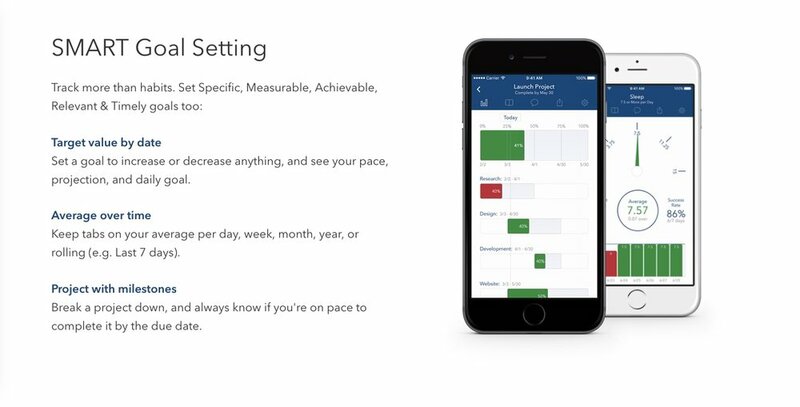 If you're tracking a long term goal, like improve sleep quality, or number of words written, this has powerful features to set milestones and track pacing. All the data you could ever want, and with reminders to track, and congratulations as well. This gives you a sense of what the app looks like - but there is tons more detail on their site. During my PhD, there was no better tool for me than Habitica. This is an online, 8-bit graphic "video game" where you set up a character, and you get rewards for finishing tasks and building habits, and you lose points when you break a streak. You separate out habits (things you want to encourage or discourage,) daily tasks (which you can set up to be infinitely variable to suit your rhythms) and to-dos (one time tasks) and assign values to each. Completing tasks earns you rewards, like sweet dragon mounts and awesome armor, and backsliding hurts your character (in a pleasingly low-stakes way, at least for me.) But what really sets this apart is the social aspects - I was in a team with other graduate student friends, and while they could see the general trends of my performance, they couldn't see my actual tasks or habits. It was just the right balance of being visible and still maintaining privacy to make this work as an accountability tool. Because I was motivated to check in often, I could see patterns and make adjustments as needed, solidifying habits and improving resilience. Plus, totally free, with the option to become a subscriber to support the open-source development team! Habitica is just the right balance of social and private, motivating and yet low-stakes. I loved it, and was an active user for almost 6 years.